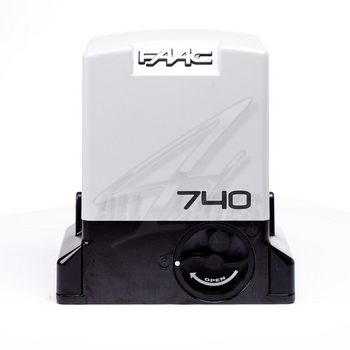 The 740-741 automated system is ideal for controlling vehicle access areas of medium transit frequency. The 740-741 automated system for sliding gates is an electro-mechanical operator transmitting motion to the sliding gate via a rack pinion or chain appropriately coupled to the gate. Operation of the sliding gate is controlled by an electronic control unit housed inside the operator or in a hermetically sealed outdoor enclosure. When, with the gate closed, the unit receives an opening command by radiocontrol or from another suitable device, it activates the motor until the opening position is reached. If automatic operation was set, the gate re-closes automatically after the selected pause time has elapsed. If the semi-automatic operation was set, a second pulse must be sent to close the gate again. An opening pulse during re-closing, always causes movement to be reversed. A stop pulse (if provided) always stops movement. The light signalling indicates that the gate is currently moving. For details on sliding gate behaviour in different function logics, consult the installation technician. The automated systems include obstacle-detection and/or safety devices (photocells, edges) that prevent the gate from closing when there is an obstacle in the area they protect. The system ensures mechanical locking when the motor is not operating and, therefore, it is not necessary to install any lock. Manual opening is, therefore, only possible by using the release system. The gearmotor does not have a mechanical clutch and, therefore, it is coupled to a unit with an electronic clutch offering the necessary anti-crushing safety if the system is completed with the necessary safety devices. A convenient manual release with customised key makes it possible to move the gate in the event of a power failure or malfunction.